"Do You Know The 3 Biggest Moneymaking Opportunities On The Internet And What They All Share In Common?" Plus: A Really Simple Way That Will Propel Your Online Business To The Highest Heights Of Internet Marketing Prominence! So, you want to earn online? It is safe to say then that if you want to become rich through online means, these three methods are the avenues you should be focusing on. There is, however, one thing that the three methods share in common one requirement that, if neglected, will provide difficulties to the participants of these approaches. All three methods require a website. In the real world, people sell their goods through their brick and mortar stores, but in the world of Internet marketing, we are not afforded such an option. How, then, can we best sell the digital items we are offering? 3. Process the orders that will be placed. This virtual store is best served via a website. Having your very own website will give you a venue in cyberspace where you can conduct your online business. Do you have some products to promote? Speak about them on your own web pages. Do you want people to know about your products? Invite them to visit your online store. Do you want an automated manner by which you can operate your Internet business? A website is the very anchor of online automation. Simply put, if you wish to do business on the World Wide Web, you need your own website. Certain sectors of the industry claim that there are exceptions. Many times, a number of online businessmen have said that people can still earn from the Internet even without the benefit of their own websites. An example of this is through affiliate marketing, where affiliates can earn commissions by simply promoting their affiliate links. However, if affiliates have their own websites, they will most certainly quadruple their earnings, simply because there will be fewer lost leads. Instead of merely promoting an affiliate link per product, for example, they can instead invite their prospects to a website that will display all the products they are promoting. This website is more or less permanent. It will occupy a particular space on the World Wide Web until it is removed. And leads can go back to this website anytime. Another great way to earn a lot of profit online is through Pay Per Click (PPC) programs, the most popular of which is Google(R) AdSense(TM). PPC programs allow enrollees to display contextually relevant ads on the web pages of their websites. Every time one of their visitors clicks on these ads, the webmasters will earn a specific sum of money. A lot of people have earned hundreds of thousands of dollars through PPC programs. It's because they have their own website, of course. Not only that, but the most successful of them have hundreds of websites, each of which is enrolled with PPC programs like Google(R) AdSense(TM). Just imagine, if one website can pull in $5 a day (a modest amount by today's standards,) how much can 100 websites earn in 24 hours? One of the best moneymaking methods online is product creation. Creating your own product to sell, with you retaining all the selling rights to it, is a surefire bet to achieving online wealth. Here's a tip: never stop creating products. The more products you have, the more leverage you'll gain in doing business on the Internet. Products can be sold for profit. Products can be added to newer products to form packages that your prospects won't be able to resist. Products can fetch lucrative joint venture proposals that can increase your profit by as much as 700. Products can be used to build your mailing list. Products can be used as the engine to a viral marketing campaign that aims to promote your brand. Each product should be supported by its own website, of course. If you will be selling it, either as a standalone item or as part of a package, you will need a sales page, embodied in the website, to persuade your prospects to buy what you're offering. If you want to use the said product as bait to add subscribers to your mailing list, you will need a website that will serve as a capture page. The first step you need to take if you want to make it big in the world of online business is to create your own website. It all starts from there. It's your headquarters in cyberspace, that one place that will serve as the anchor of your enterprise and the center of your operations. Succeeding in this field requires that you should not take any shortcuts. You need a website. You need to invest in its creation. It's that one thing that will define your online business. It's that one thing that will serve as the backbone of the success you will achieve in this industry. I have been in this business for many years now, and by my own estimation, around 32 of online businessmen are operating their ventures without the benefit of their own websites. 1. Ignorance. Quite a number of Internet marketers do not fully realize the many benefits that a website provides. For them, they'd rather save the meager amount required by the creation, requisites (domain name and web hosting,) and maintenance of these web pages. What they don't know is that such a small investment will actually have a fantastically huge ROI! 2. Lack of knowledge/skills. A bigger number of Internet marketers actually know the value of having their own websites, BUT, they don't have the knowledge nor the skills required in creating one. They do not know HTML or any programming language, for example. They don't know CSS, PHP and the other web platforms that are necessitated by the current generation. 3. Good HTML editors are too expensive. Indeed, there are powerful and comprehensive tools available for them. But how much will these tools cost? Their prices can be quite prohibitive, especially for online businessmen who are just starting out. 4. HTML editors are not really user-friendly. Though many Website creation programs claim to have intuitive interfaces, they are hardly that. Name the most popular HTML editors, for example. Do you think the regular novice will be able to create a website immediately, without prior orientation on the matter? 5. HTML editors are not really fast. When you're in the business of producing a lot of websites, for example, conventional HTML editors will require a lot of hours. You have to create each website from scratch every time. The process is hardly automated. Everything is manually executed. Just thinking about these obstacles has caused many online businessmen to give up on the idea of having their own websites. This is a costly, costly mistake, considering the extreme importance of websites to online businesses in this day and age. Finally, You Can Now Create Websites Fast And Easy! I want to introduce to you a grand solution to the problems we have discussed above, one which will completely obliterate any and all excuses that online businessmen have for not creating their own websites. The Smart And Convenient Way Of Creating Websites In A Snap! The Turbo Website Generator is more than your average HTML editor. It is a FAST and EFFICIENT website creator that is built to generate web pages easily and expediently. The Turbo Website Generator allows the storage of templates that you can use for your pages. Once stored, you can simply CHOOSE any of these templates to serve as the spine for the web page you are creating. Thereafter, you can simply copy and paste the content you want to add into the body of the web page. And once that's done, you'll be surprised to know that the Turbo Website Generator will have automatically compiled such pages into one congruent website. You can keep adding pages, and the Turbo Website Generator will make sure that the new page is included in the outline of the website itself. And when you're done, all you have to do is click on a button and your website will be live! Create templates easily through a What-You-See-Is-What-You-Get (WYSIWYG) environment. Use existing templates that come with the Turbo Website Generator to make things even easier! Create blocks of text for each page conveniently. Create any number of pages using the templates you have prepared, or new pages from scratch to make them different from the rest. Create pages FAST using the intelligent system that refreshes the text area for every new entry, without erasing the code of the template that has been selected. All you have to do is add content and the Turbo Website Generator will take care of the rest! EXCLUSIVE: Include and manage #tags# in the source code. This is done in an automated manner. You won't have to locate specific blocks of codes just to insert your #tags#. The Turbo Website Generator comes with a feature that allows you to specify the #tags#, and the system will automatically sort them out by itself. EXCLUSIVE: You can choose to use a reverse method in creating a website. Create the web pages first, then compile them under one website! Everything, again, will be automated. Just point to the web pages you want to compile and the Turbo Website Generator will take care of the rest! Add and exclude pages from a website project with ease. Just point and click. Amazing simplicity, fantastic flexibility, deep applications... these are what the Turbo Website Generator is all about! Do you want to learn how you can maximize the fabulous features of the Turbo Website Generator? If you want to create hundreds, if not thousands, of niche sites for PPC income purposes, then the Turbo Website Generator can be your best partner for the task. 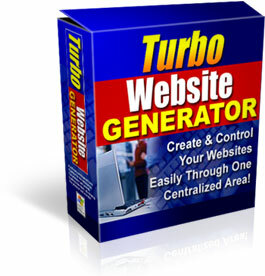 With the Turbo Website Generator, you can create niche sites FAST! If you have the content prepared, it is even possible to create hundreds of websites in a few hours, and that's no exaggeration! If you're running an affiliate program, you can provide your affiliates with promotional tools like web pages they can use. Give them the template and allow them to modify the content using the features of the Turbo Website Generator. If you're an affiliate and you wish to have a web page for every affiliate product you are promoting, then the Turbo Website Generator will help you come up with such pages within minutes after you sign up as an affiliate! Are you a prolific product creator who comes up with new products everyday? Do you need sales pages or description pages for each of them? The Turbo Website Generator is the only program that is equally as prolific. It is the only program that will be able to keep up with your creative juices! Do you just want to create websites? There is no easier HTML editor than the Turbo Website Generator! The Turbo Website Generator will prove to be the best business partner you could ever have when it comes to this point! Order the Turbo Website Generator today and start generating a windfall of earnings for your online enterprise! Turbo Website Generator is a PHP/MySQL script that works on any server that supports the PHP language! Of Creating Websites In A Snap!